The index opened flat and after a small dip saw the index move up and stayed strong throughout the entire session of trade and closed near the top at 8389.90, gain of 32.05 points. The broader market was also positive, with 829 advances to 717 declines. Tentative Range for the series stays at 8200-8500. No addition seen at any strike with short covering seen at 8400 and below strike prices. Put option 8400-8000 added huge 18.18 lacs OI with profit booking seen at 7900 strike price. 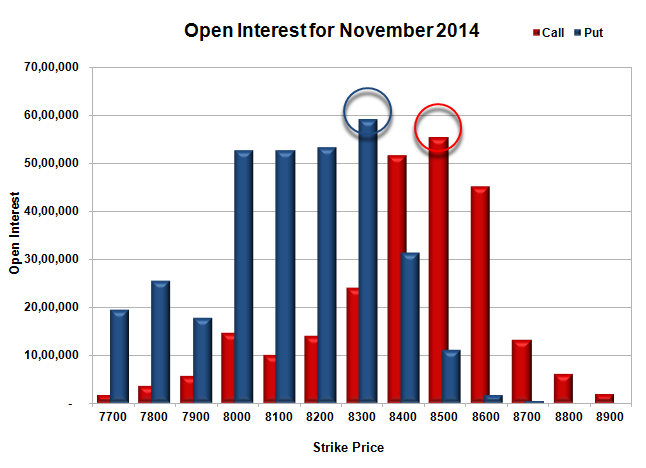 Nifty Open Interest is at 2,28,47,725 down by 2,52,375, with increase in price, probably huge short covering. 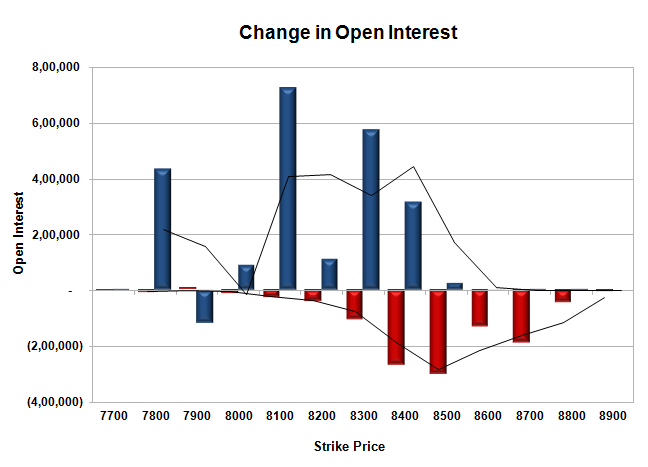 Bank Nifty Open Interest is at 21,33,375 up by 86,975, with increase in price, probably huge long build-up. FII’s sold 3.95 lacs Futures, which includes 8128 contracts long liquidation and 7668 contracts short build-up, with decrease in net OI by 460 contracts (includes 26707 longs to 42503 shorts for the day) and the Average Price comes to 8398.60. FII’s Index future open contract as on date is 727677 Longs to 158960 Shorts, net long 568717 down by 15796 contracts. Initial and best support at 8300, with highest OI of 59.13 lacs and below that at 8200 with OI of 53.20 lacs. Initial resistance still at 8400, with huge OI of 51.58 lacs and above that at 8500 with huge OI of 55.44 lacs. 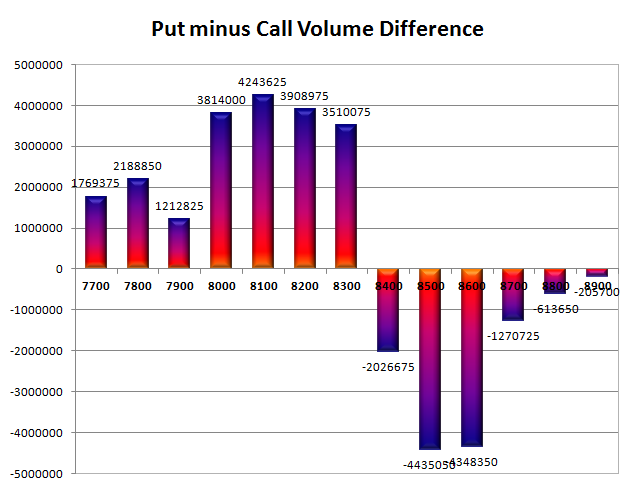 Day Range as per Option Table is 8326 - 8439 and as per VIX is 8329 - 8451 with 8379 as the Pivot.